SpaceX's CRS-14 Dragon capsule is released into space by the robotic arm on the International Space Station on May 5, 2018. Dragon will return 4,000 lbs (1,800 kilograms) of science samples and gear to Earth. A SpaceX Dragon cargo ship is returning to Earth today (May 5) with more than 2 tons of NASA gear from the International Space Station. The capsule's splashdown capped a busy day for NASA, which began its weekend with a launch to Mars. The Dragon capsule left the space station this morning at 9:23 a.m. EDT (1323 GMT) when it was released by the orbiting laboratory's robotic arm. The spacecraft is packed with over 4,000 lbs. (1,800 kilograms) of experiment samples and other gear to Earth for NASA, and is returning to Earth two days late. SpaceX and NASA initially scheduled Dragon's return for Wednesday (May 2), but rough seas at the capsule's splashdown zone prompted a delay to await better sea conditions. 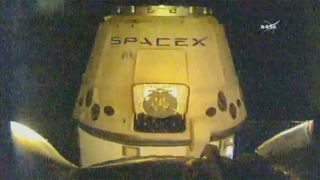 Dragon splashed down today at 3:03 p.m. EDT (1903 GMT) in the Pacific Ocean. The spacecraft's splashdown area was located 400 miles (643 kilometers) southwest of Long Beach, California, off the coast of Baja California, NASA officials said. "Good splashdown of Dragon confirmed, completing SpaceX’s third resupply mission to and from the @Space_Station with a flight-proven spacecraft," SpaceX representatives said via Twitter. "It's been a big day here at @NASA!" NASA Administrator Jim Bridenstine wrote on Twitter. "@NASAInSight successfully launched and is on its way to Mars! @SpaceX is now bringing critical science investigations home from the @Space_Station." Dragon is also returning NASA's Robonaut 2 robot, which was designed to help astronauts with their daily chores in space. Robonaut 2 broke down in 2014 and is being returned for analysis and repair. The space station's crew appeared to have a bit of fun while packing Robonaut 2 for its trip home. NASA astronaut Ricky Arnold donned Robonaut 2's head like a mask for a bit of Twitter photo fun. "...to seek out new life and new civilizations," Arnold wrote on Twitter. Arnold is one of six space travelers on the space station's current Expedition 55 crew. Joining him on the mission are NASA astronauts Scott Tingle and Drew Feustel, astronaut Norishige Kanai of the Japan Aerospace Exploration Agency, and cosmonauts Oleg Artemyev and Anton Shkaplerov of Russia's Roscosmos space agency. Shkaplerov is commander of the station's crew. Editor's note: This story was originally posted at 9:45 a.m. EDT and was updated at 5:25 p.m. EDT reflect the successful splashdown by Dragon.